If there's one technology that's taking over the world right now, it's virtual reality. Key players like Samsung, HTC, Sony and Facebook-owned Oculus are already pioneering VR with their own headsets, and everyone's excited about them. However, the fact is, most of us associate VR with gaming. Of course, headsets like the PlayStation VR are a lot of fun, but the potential of virtual reality is much more diverse. This technology is also making major waves in key areas such as education, healthcare and business. And now it's expanding to the realm of food and drink. Many in the sector believe that virtual reality has the ability to transform the way we eat and drink, and there's a growing number of hospitality providers offering innovative experiences to consumers. In a few years, you could very well be sitting in a restaurant or pub with a headset on while you dig into a burger or down a pint of beer. A big part of virtual reality is about intensifying our senses, so it's no wonder it's doing wonders in the world of food and drink. Jamie Field, who leads production at virtual reality specialist TopLine Comms, says VR devices can revolutionise the visual and auditory factors of eating a meal. "I think most people would agree that a beer somehow tastes better when consumed on a sun lounger gazing at the ocean on a hot summer's day. "And since VR headsets have become easily accessible, it's no surprise that the food and drink industry is seizing the opportunity to use the technology to enhance the experience it offers to consumers," he says. "The potential opportunities for Virtual Reality in the food industry are boundless, but at its most basic level, VR can easily provide a unique visual and auditory environment to accompany a meal. "The theory goes that the more senses you engage, the more rewarding your eating experience will be, so adding a diffuser that releases environment-appropriate scents and changing the physical temperature of the room would be the next steps." You may not have heard of VR beer, but soon, you could be ordering it down your local. Independent Scottish brewer Innis & Gunn is at the forefront of this area with a virtual reality experience to change the way customers taste and enjoy their favourite beers. 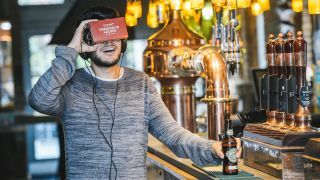 At participating venues, customers who order the brewer's beer or lager are being given a virtual reality headset to add a multi-sensory aspect to their drink. Developed with cognitive neuroscientist Dr Jacob Jolij, the experience transports the drinker to different Scottish landscapes based on the flavor profiles of the drinks. By immersing customers in these rural settings, their sight and sound senses are ignited. As a result, the taste of the beers is heightened, and according to the company, a new world of beer drinking is revealed. For example, you could be standing next to a secluded lake in the highlands, and all of a sudden, your mind starts to focus on the smoothness of the beer. "A taste experience is not just a matter of chemistry and biology. Whenever you take a sip of your favourite beer you do not just taste the water, the grains, and the hops, but your brain adds in your previous memories, surroundings, and expectations," says Dr Jolij. "Immersing the drinker in this virtual reality world created by Innis & Gunn, is a very powerful way of enhancing the taste experience. It will change the way your brain processes and interprets the signals coming from your taste buds, drawing on personal memories of sight and sound to create a unique experience of the beer for every drinker."